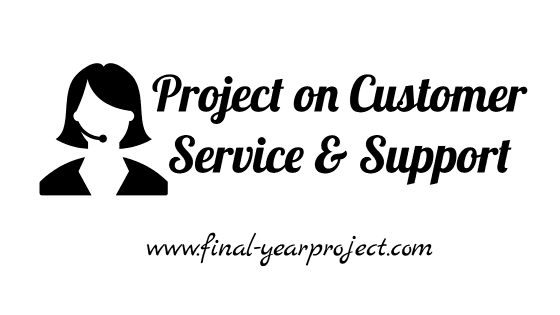 This is a nice MBA project work on "Customer service & support". Customer service and support (CSS) is the part of a company's customer relationship management (CRM) department that interacts with a customer for their immediate benefit, including components such as the contact center, the help desk, and the call management system. This report is prepared in special preference to Dell product support. You can also Subscribe to FINAL YEAR PROJECT'S by Email for more such projects and seminar. Its full cycle contains logging of the initial service request by the customer, verifying the contractual coverage as regards warranties and guarantees, assigning and sending out appropriate field engineers, supporting field engineers in the form of access to the organization database, providing depot repair & billing of a customer. 1. Cut costs and improve workflow by automating the business processes associated with customer support case assignment, management and escalation. 2. Route cases intelligently, enabling fast, efficient prioritization of all your customer support cases. 3. Save valuable time by giving support reps all the information they need within a single, powerful application; reps no longer waste time hunting for contracts, invoices, or other data in disparate systems or departments. 4. Meet the requirements of your support agreements and give customers the world-class service that will lead to longer, more profitable relationships. 5. View escalated support cases as part of reports and key performance indicators (KPIs), giving customer service reps the ability to analyze this data with a few clicks on the Real-time Dashboard. 6. Keep service reps in the loop by notifying them whenever changes are made to their assigned cases; they will also be notified when someone changes the priority or status on a case. Use this project on customer service and support in reference to Dell your reference and study work and thanks to the author.